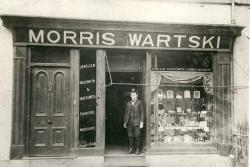 An early image of Bangor's Wartski's shop.A Bangor University Professor is to launch an exhibition, map and app about the Jewish history of Bangor. The launch will take place at the ‘Bangor Arts Initiative’ Gallery in the Deiniol Shopping Centre, Bangor High Street, from 2-4 p.m. on Sunday 17th March. All are welcome and it’s free. 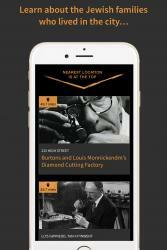 Some images from the app.Local residents are encouraged to come and share their memories of Bangor’s Jewish community, including the well-known stores, Wartski’s and Pollecoff’s. Jews moved to Bangor in larger numbers in the late nineteenth century. They were escaping persecution in Eastern Europe but also wished to better themselves in Britain. Jews fleeing the Nazis settled in Bangor or were evacuated here during World War II. 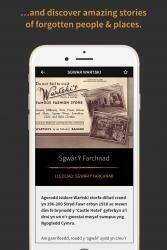 Jews integrated very well into the local community, even learning Welsh and participating in local Eisteddfodau.